New York City gave us the Manhattan. Florence gave us the Negroni. Santiago de Cuba gave us the daiquiri. Into such hallowed geographies of mixological offerings, Milwaukee bears its own: the Pink Squirrel. Don't call animal control just yet. It's the tail end of summer, after all. Give the rosy rodent a chance. This is the season for blissful bites of frozen desserts and the agony of brain freeze, for sitting on porches and soaking up the sun, for ordering a two-scoop cone and mastering that particular rotational thumb-wrist-tongue pivot by which the human animal prevents a tower of melting sweetness from rivuleting down its arm. It is the season to give the Pink Squirrel and its ice cream cocktail kin a fair shake (or a fair blend, as the case may be) – to consider these drinks in their original habitat, and to imagine how they might evolve. The bar that claims the Pink Squirrel – Bryant's Cocktail Lounge in Milwaukee, which has been around since 1936 – doesn't technically have proof of the provenance, owner John Dye admits, but the drink has been in the bar's Rolodex of cocktails for many decades. Dye says that customers and former employees who go back 50-some years with the bar have long attested to its roots there. A super-sweet combination of ice cream, creme de cacao and creme de noyaux (an almond-flavored liqueur), the Pink Squirrel gets its hue from the red color of creme de noyaux, caused by an insect-derived coloring called cochineal. It's a liqueur that, even now, can take some tracking down; you can substitute a good amaretto, but if you do, your Squirrel's cheeks will be missing that adorable blush. The Pink Squirrel family includes – as at least nominal members – such ice cream drinks as the Golden Cadillac (Galliano and creme de cacao), the Grasshopper (creme de menthe and creme de cacao), the Hummer (rum and Kahlua) and the brandy Alexander (brandy and creme de cacao). They all had their heyday in the supper clubs of the dairy-delirious Midwest in the mid-20th century, places where people went to spend whole evenings eating, drinking, socializing and often taking in a show. The dairy ingredient varies recipe to recipe, with some calling for ice cream and others for heavy cream, but either way, the contributions of the region's cows were central. I sometimes think of this scene as it relates to drinks. Here and there, bartenders – or underutilized booze brands whose sales would be boosted by the contemporary trending of a cocktail that calls for them – try to bring back an old drink, hoping it will catch on across the cocktail world. It's not unreasonable; after all, the scene is laden with such successes: the Last Word, the Aviation, the Old-Fashioned (once considered the old-manniest of old-man drinks). They're the condors, if you will. But there are plenty of dinosaurs out there, too, and the occasional prehistoric squirrel. Outside of their natural habitat, where I can see their taste-a-bygone-era appeal, many classic ice cream cocktail recipes for me fall into the dinosaur category. A couple of sips and I'm pretty much done; the very-sweet booze and the very-sweet ice cream together tire out my palate pretty quickly. Even at Bryant's, which sources fine ice cream from a farm nearby and where the clientele “do love our dairy,” Dye says, most people order only one Pink Squirrel. Ice cream drinks take on some appeal for me when sweetness and creaminess are balanced with other elements in ways that help give them a modern appeal. Take what bartender Chantal Tseng has been doing at the ice cream socials at the Reading Room in Washington: drinks like Southern Nuts, which combines bourbon, amontillado sherry, salted caramel ice cream, cola and peanuts, riffing on the old Southern tradition of dropping peanuts into a bottle of Coke. 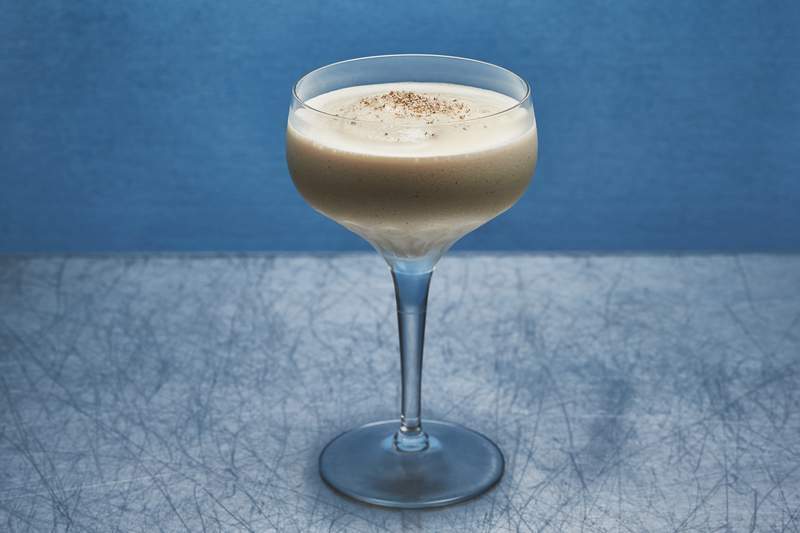 Or her From North to South by Way of East, where the sweetness of vanilla ice cream and PX sherry get a bump of brightness from sparkling cider and ginger juice and a hit of dusky spices in the garnish. Whatever direction you take an ice cream drink, you have to make choices about the texture you want. You can shake all the ingredients together and strain them, which will give you a richly creamy drink without any of the ice cream solids remaining. 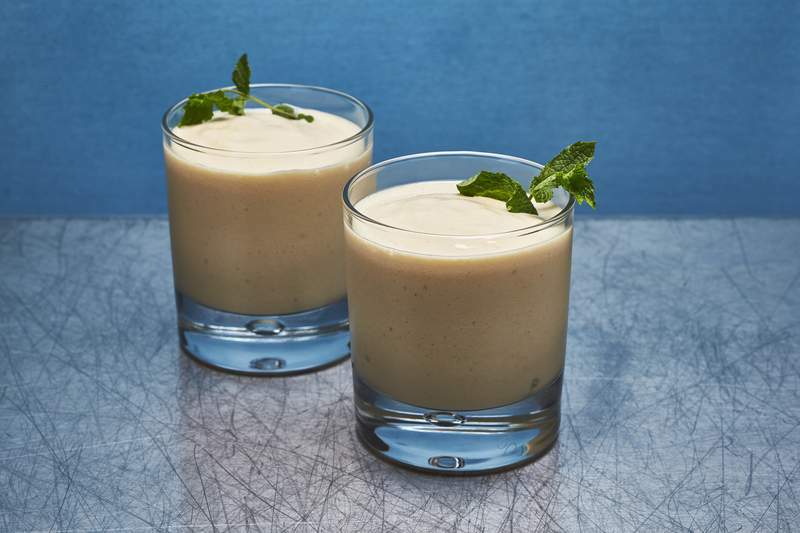 Or you can blend them, resulting in a thick, spoonable drink (like the Bourbon Peach Shake). Tseng frequently takes an ice cream float-ish approach. Her first experience with a really great, sophisticated ice cream cocktail, she says, was the Soyer au Champagne, a drink that dates to the 1800s. Like some of those Midwestern variants, it combines ice cream and liqueur, but also calls for sparkling wine, which adds complexity without adding another aggressively sweet component. “It's not just put a bunch of syrupy things on top of something that's already sweet,” Tseng says. The champagne also adds texture, one she now incorporates frequently, building ice cream and alcoholic ingredients in a glass and then topping it all off with sparkling wine, soda water or other kinds of bubbly. The ice cream and other ingredients are never fully combined, making every sip or spoonful a little different from the last. I took the shaken approach to the Black Squirrel, a tribute to those local rodents brought to Washington back in the early 1900s. Incorporating the bittersweet, caramely Cynar, dark rum and a bit of salt, it doesn't have the rosy glow of the drink that inspired it. But for me, this after-dinner Squirrel hits the sweet spot, contentedly flicking its tail between the overpowering decadence of those nostalgic supper club drinks and the bitterness of a digestivo that's often served as a last, bracing face-punch to the evening. It's an ice cream drink with an edge, a note to warn you: Drink slowly, and avoid the brain freeze. A riff on one of the best-known ice cream drinks (a Midwestern dessert cocktail classic, the super-sweet Pink Squirrel), this variation keeps the rich and creamy heart of the drink but cuts its sweet edge by incorporating the bitter amaro Cynar. The higher-proof Cynar 70 works well here, but you can substitute regular Cynar or C3 Carciofo from Don Ciccio and Figli. 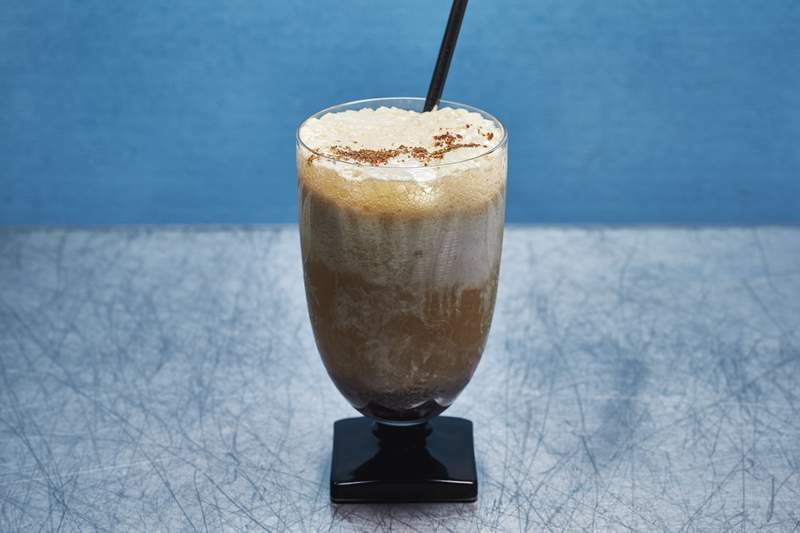 Combine the rum, Cynar, ice cream, crushed ice and salt in a blender. Blend on high speed until creamy, then strain into the coupe (to remove any remaining chunks of ice). Top with a grating of nutmeg and serve right away. Makes 1 serving. One of the treats Chantal Tseng serves at the Reading Room/Petworth Citizen's ice cream social nights, this blender cocktail complements the sweetness of vanilla ice cream and PX sherry with notes of bright apple and spice. You can squeeze ginger juice from freshly grated ginger; also look for fresh ginger juice at natural foods stores or buy bottled ginger juice, such as the Ginger People brand. Scoop the ice cream into an absinthe/parfait glass. Top with the sherry, ginger juice and sparkling cider, then sprinkle with the five-spice powder. Serve with a straw. Makes 1 serving. Bourbon and peaches have a natural harmony; when you swirl them up with ice cream, they morph into a perfect treat for a hot summer afternoon. You'll need fragrant, ripe fruit for this recipe – better to substitute with great nectarines rather than opt for mediocre peaches. We used Breyer's peach ice cream, but if you can't find it, you can use a good vanilla ice cream instead and augment the peach flavor by adding a few more ounces of peaches or a splash of peach liqueur such as Mathilde Peche. Combine the crushed ice, bourbon, ice cream, fruit, bitters and salt in a blender. Blend on high speed, until smooth and creamy. Add several ice cubes to each rocks glass, then pour the peach shake over each portion of ice. Garnish each drink with a sprig of mint, if desired. Note: To peel peaches, score their bottoms with a shallow “X” and drop into boiling water for a few minutes. Drain; when cool enough to handle, discard the skins, which should slip off easily.